NASHVILLE, Tenn.-NewSong's Winter Jam 2015 Tour Spectacular shattered attendance records and made history this year, wrapping its biggest tour ever with more than 600,000 people at a total of 47 shows across the country. Christian music's #1 tour in the world, Winter Jam attendance surpassed such tours as Fleetwood Mac, Maroon 5 and Miranda Lambert, among others, according to Pollstar's 2015 First Quarter Year To Date Worldwide Ticket Sales Top 100 Tours chart. Garnering 38 sellouts, Winter Jam kicked-off its 20th anniversary year January 2, playing to capacity audiences at St. Louis' 19,000-seat Scottrade Center; Tampa, Florida's Amalie Arena (over 17,000 seats); and Detroit's nearly 17,000-seat The Palace of Auburn Hills, among numerous major venues, before concluding March 29. Highlights of 2015's groundbreaking tour included the second annual "Dome Spectacular," Winter Jam's biggest single show each year, which saw more than 30,000 people at Atlanta's Georgia Dome in February, as well as a live webcast from Houston's Toyota Center later that month. Presenting the webcast for the third year in a row, Winter Jam partnered with Blue Scout Media's StageHop.com to offer viewers around the world an unprecedented front row seat for one of music's biggest tours. In addition, select Winter Jam stops around the country featured appearances by Roma Downey and Mark Burnett, producers of NBC's hit television event, "A.D. The Bible Continues," as well as appearances in various cities by Sadie Robertson, among the stars of A&E's "Duck Dynasty" and a former ABC "Dancing With The Stars" contestant. "God has entrusted us with Winter Jam for 20 years now," said NewSong's Eddie Carswell. "We are humbled by His hand on the tour, so while we make lifelong friends and wonderful memories each year, it's our greatest joy to witness people come to Christ through the ministry of Winter Jam." Created and hosted by GRAMMY®-nominated NewSong, Winter Jam exploded from a single show in 1995 to one of the music industry's biggest tours today. 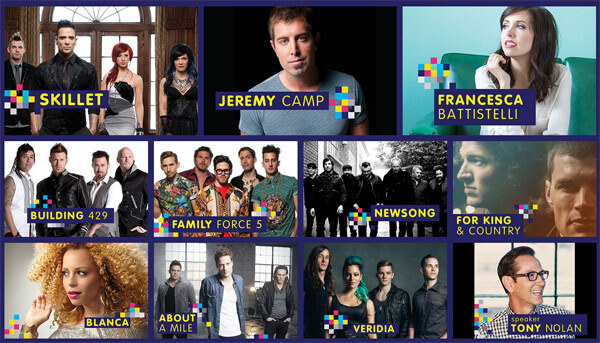 Winter Jam 2015 was headlined by GRAMMY®-nominated platinum-selling rockers Skillet, along with Jeremy Camp, Francesca Battistelli, Building 429, for KING & COUNTRY, Family Force 5 and evangelist Tony Nolan, while the Pre-Jam Party included Blanca, About A Mile and VERIDIA. Promoted by Premier Productions and presented by Holt International, tour sponsors included Pure Flix's "Do You Believe? "; NBC's "A.D. The Bible Continues"; University of Mobile; Teen Missions International; Pepsi; TheOverflow.com; Camp Electric; PREMIER Vacations & Events; Xtreme Conferences; Texas TransEastern; and Wayne E. Bailey Produce. For further information, visit jamtour.com or turningpointpr.com. For more info on Skillet visit the JFH Artists Database.